It's Sunday and we all want to celebrate with some pomp and splendour, call in the gang and head out together, talking about old times and new. But, it's way past breakfast and waiting for lunch is too much to expect from us. This is where brunch comes in – mix the two meals, throw in a couple of glasses (or more) of mimosas and call it a day. We ardently admire this concept, and to share the love, have noted down our Sunday brunch favourites, from prices lowest to highest for optimal ease. Asia Kitchen & Bar has an awesome weekend brunch buffet that gives you unlimited, copious amounts of food for only INR 733 for non-vegetarian, and INR 662 for the vegetarian option; all-inclusive. Choose between non-veg and veg tempura and types of sushi. There’s also a variety of baos (sundried tomato bao, pork belly bao and more) to be had, edamame dim sum, among others. Brunch at this cosy Mediterranean restaurant in Andheri is always a good idea. It’s a relaxed setting with good music and food (you can choose from Italian, Greek or Spanish). The food ranges from fluffy omelettes to French toast, and from pasta to cheesy risotto. Along with sips of sangria, it’s a great place to tuck in, relax and spend away a lazy Sunday. Desserts here are especially divine such as chocolate indulgence, pineapple tart and cheesecake, and you know what they say, there’s nothing like a good (blueberry) cheesecake. Brunches get a little more exciting here with their karaoke station, just in case you feel like belting out a few tunes. Make sure you make your bookings way in advance. Their brunch tables run out real fast. Sometimes we just need to overeat on our very own cuisine. We head to Saptami when we’re looking for a brunch that has more to offer than just Italian and Oriental (and quite frankly is yummy). They focus on street food—which is excellent and also have dishes like paneer tikka, malabari prawns, dhaba-like paneer, and even Bengali fish curry. #LBBTip: A brunch at Saptami also gets you one-time entry into Holiday Inn’s swimming pool, so carry your costumes for a post-brunch dip in the water. This Michelin-starred restaurant deserves a visit on Sunday afternoon for its Supreme Set Lunch which has one cocktail, one starter, one salad, one main course, a choice of rice or noodles, and a dessert, all for INR 3,000 plus taxes. #LBBTip: We recommend booking here in advance, as getting a table on the spot would require a cosmic interplay of coincidence and luck. 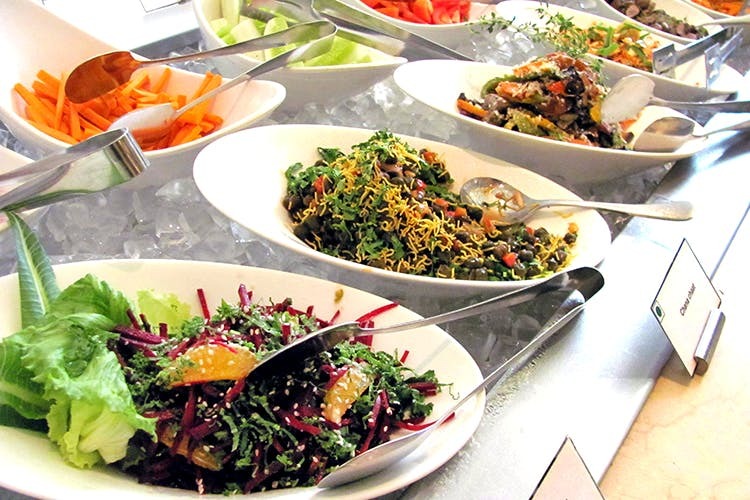 When it comes to a lavish brunch scene in Mumbai, no one does it the way the JW Cafe does. This coffee shop at the JW Marriot opens up its Sunday brunch with a widespread buffet, and expect any dish you can imagine to be at the table. Biryani? Yes. Sushi? Of course. Waffles? Oh, you’re just testing them. Find soups, starters, seafood, Thai food, regular breakfast items such as poha, upma, south Indian food, pasta and even a range of burgers. Your quintessential South Bombay brunch place, The Clearing House has won us over with its delectable spread that not only includes indulgent dishes like Crispy Fried Chicken, Truffle Mac n Cheese and Polenta Cake with Mushroom Ragout, there's also the Greens + Grains section of the menu that offers dishes like Red Quinoa and Roasted Cauliflower Salad, served with haricot verte, dried cranberry, crispy onion and tahini vinaigrette, Blackened Spiced Chicken and Avocado Salad and more. Do not and we repeat, do not miss out on their dessert with Honey Toast, condensed milk ice cream and pickled strawberry compote; Doughwich with peanut butter and Belgian chocolate ice cream.